My first addition to the house (after painting it white) was a scrap of paper that I had in my cast-off box. It's this beautiful Market Street Stamps Vintage Wallpaper stamp in red ink on white paper. 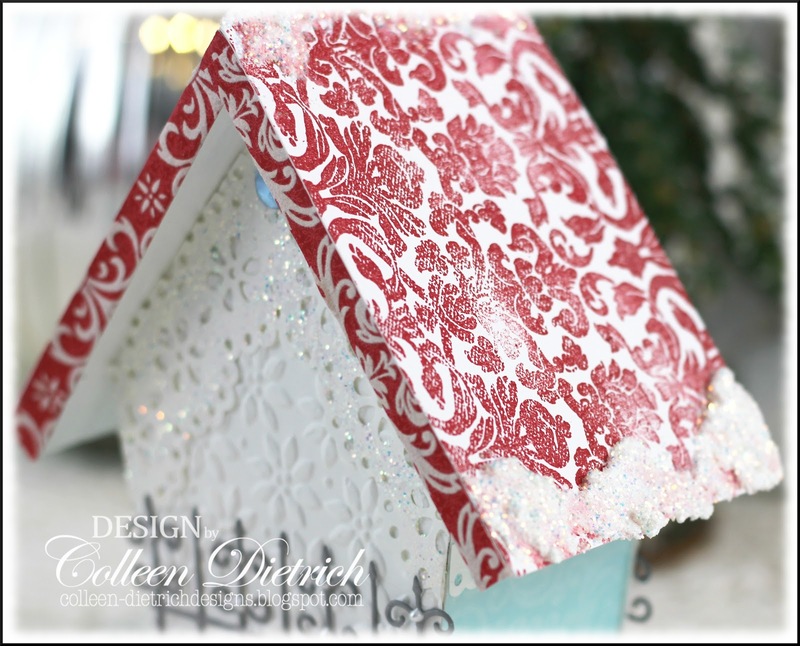 I added some skinny strips of red flocked patterned paper from Stampin' Up! along the exposed edges. And what's a winter roof without some sparkling snow? The snow was made with Snow-Tex, which has the texture of cake frosting, and then sprinkled some iridescent glitter on top. On the two narrow sides, I repurposed some gorgeous aqua pearly paper from a booklet we received while in Hawaii. I topped each wall with a doily-edged punch border that is also 'glitterfied'. The photo below shows the back of the house. 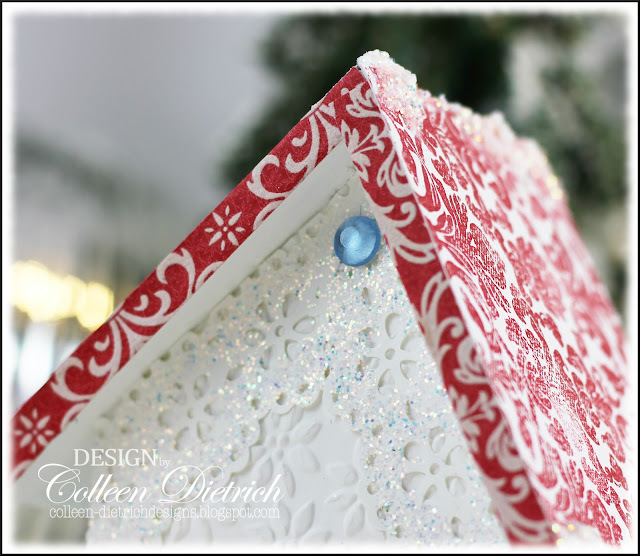 I covered both the front and back of the house with embossed white cardstock. 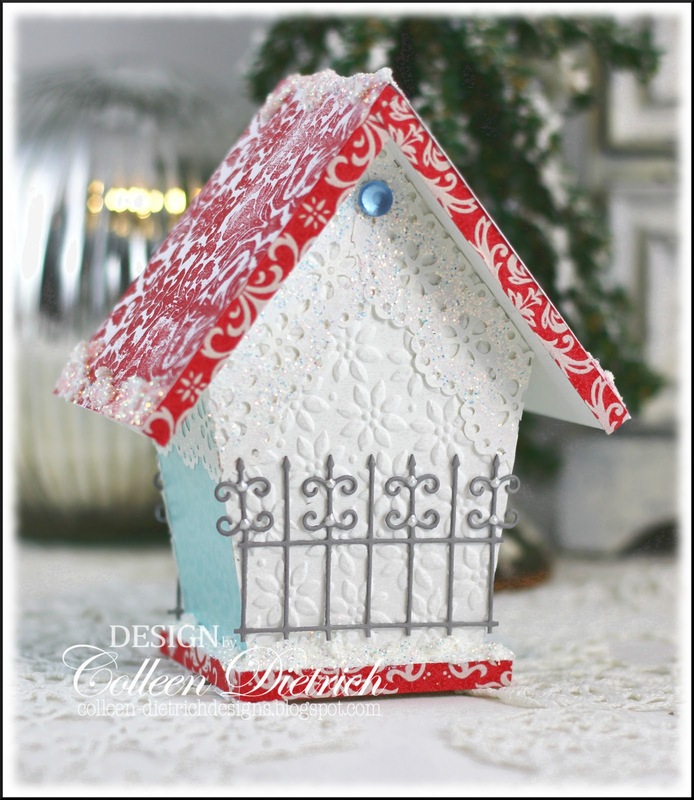 I also added a pale gray wrought iron fence die, which is decorated with Liquid Pearls. One light blue gem graces the eaves on the back of the house. The wreath die cut is made from the same blue paper on the sides of the house. I touched it with some Liquid Pearls. The wrought iron fence sports some of that, too. The little bird perch has a large pearl on the end as it looked too plain with nothing there. Lawnscaping - Make It Shine - I used glitter - lots of glitter! Only a week to go 'til Christmas! Do you have your shopping all finished? How 'bout presents wrapped? I'm still working on that! This house is gorgeous! What a beautiful decoration & keepsake all at the same time :) I especially love the delicate detail of the wreath & the fence! So far I have to (omg) address & finally mail cards; bake; decorate; wrap presents. But the presents are purchased, so there's that ;) We are pretty low-key around here but it's still getting crunchy for time! This is GORGEOUS!! I love love love love it!! WOWWWWWWWWWW!!!! WOW!!!! There are no words Colleen...my OH my what an amazing project. Great work my friend...really great!!! This is gorgeous, Colleen! I love all the pretty details and the snow! Oh, I love the snow! Ooooh, this is sooo pretty! AND so was your card I got in the mail today! What a treasure it was, and this will be as well! LOVE it! It sure sounds like you had some fun with that adorable bird house.Be careful you might find yourself with an entire community. Tee hee! I want one! LOL This is so adorable. Revamping items is so fun! Fabulous bird house, Colleen! Love all the details! 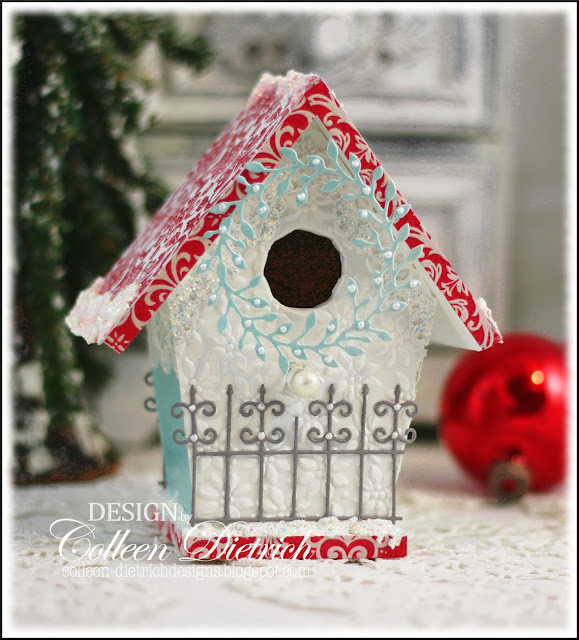 Colleen, this birdhouse is absolutely gorgeous! I just LOVE those colors for Christmas, one of my new fave holiday combos. And look at all the punches and glitter!! Fabulous creation, my friend!! wow wee Colleen...this is amazing.. I love everything about it.. and that little fence...how cute... girl you are amazing.. Such a cute birdhouse! Very upscale too LOL! Great details and a fabulous job on it! Sorry but I've been ill again Colleen and haven't been around much for a couple of weeks. Feeling a little more human now and actually made something today which is only the second thing in two weeks - you know how it goes! You have put so much work into this charming little bird house - it's absolutely stunning. I like that you've used loads of glitter but it is applied with a delicate touch and just makes your house gleam! I do hope you are well and that you have stopped worrying about Christmas. I was getting worried about how behind I was then I remembered your post when you were feeling the same - I've decided I can't be recovering and be a domestic goddess so I'll do a little of each and that will have to suffice! Luckily my Aunt is having us for Christmas lunch so that is a little less stressful. I wish you a wonderful holiday season and thank you for being such an inspiration and taking time to visit little old (ish!!) me! Adorable! Seeing all these 'snowy' christmas creations is making me feel really hot! That doesn't make sense does it? I mean it's so hot and humid here - I wish I could be in the northern hemisphere for Christmas! WOW, Colleen this is gorgeous.... love these colors. The wreath looks fabulous against the white... love the addition of the Liquid Pearls and your fence is the ideal finishing touch. This is soooooo pretty, Miss Talented Lady!!!! WOW!! This is gorgeous. I just love every little detail you added. Love the photos of you house! so pretty! A masterpiece, Colleen! Absolutely stunning! Ooh, la, la....so glad I got over to your blog and saw this. You know I'm a bird and birdhouse lover. How fabulous this turned out. Wow! I see you've made some beautiful cards while I've been away. I took some time off today to make a card. Renovations are almost finshed. I won't get my tile backsplash in the kitchen until after Christmas. Drat! I have been working hard this week to get things put back together and cleaning done. I hope to get in the kitchen Thursday to make some goodies. Shopping is almost finished. Hope things are well with you and you're going to have a blessed Christmas. So cool!!!! My favorite detail is the wrought iron fence! Gotta go, still working on cards and everything. Will I ever learn? Nah, not me! Colleen, your 3D house is MAGNIFICENT. I love the glitterfied accents and details! You are amazing, my friend. Your attention to detail is fabulous! Merry Christmas, and all the best for 2013! Gorgeous house. Thanks for playing along with us this week in the "What's Your Favorite" challenge over at the Simon Says Stamp Challenge Blog. 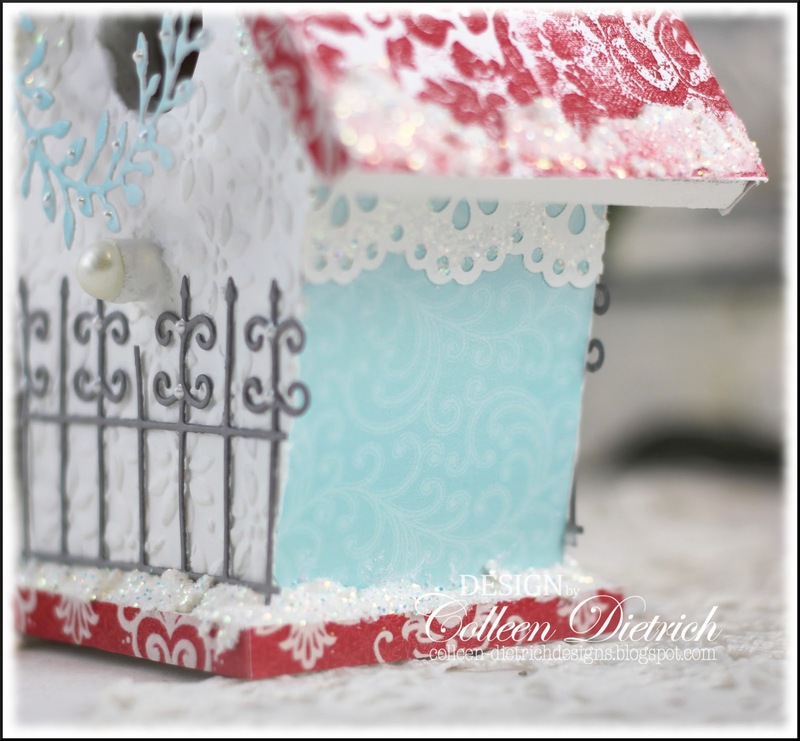 Such a darling creation you made of this sweet little bird house, Colleen! Love the color palette and all the glitter! You can display this little gem all winter long! Hope all is well with you and wishing you a wonderful blessed Christmas and joyous New Year, hugs! WOW! Just wow. I have no words. This is breathtaking!!! Merry Christmas! 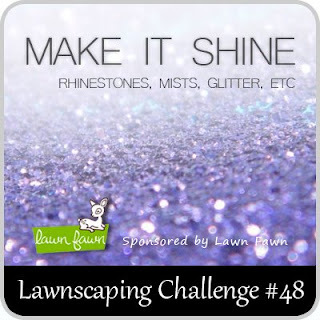 And thanks so much for playing along with us Lawnscaping gals for the Make it Shine challenge! 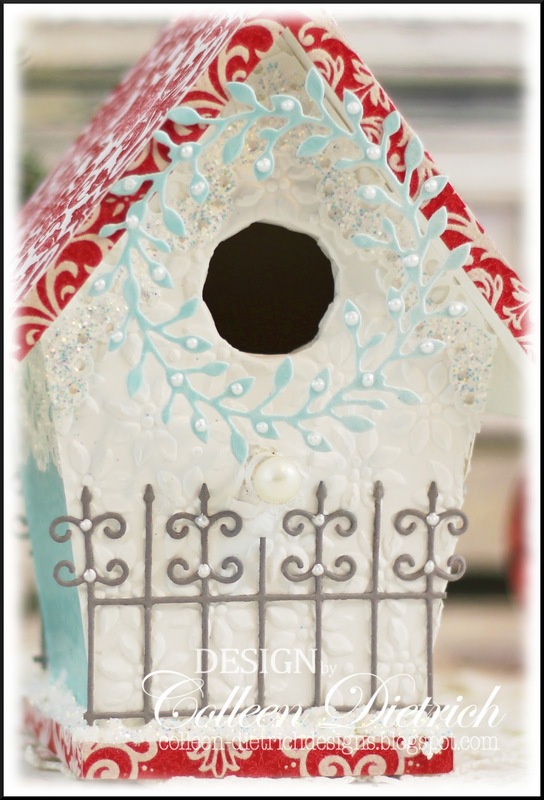 Absolutely GORGEOUS bird house...I love all your details!!! GORGEOUS house, Colleen! LOVE it! Cute as can be! I just love all the lacy details and shimmer and shine! Oh, it turned out so sweet! How fun this must have been! I'm so glad you shared it, Colleen. Absolutely gorgeous! I'm totally impressed at your skills! Thanks for playing with us at Lawnscaping!